A Buncombe County man and his 3-year-old daughter are counting their blessings after they were nearly killed Thursday morning. ASHEVILLE, N.C. -- A Buncombe County man and his 3-year-old daughter are counting their blessings after they were nearly killed by a piece of debris Thursday morning. Greg Henson told WLOS he was driving to Asheville, with his daughter in the back seat, when the incident happened. "I noticed debris in the road and was hoping somebody wouldn't hit it, and then somebody hit it," Henson said. "Either the front or back tire (of the car in front of me) caught just like the edge of it, and that kind of like catapulted it up in the air." 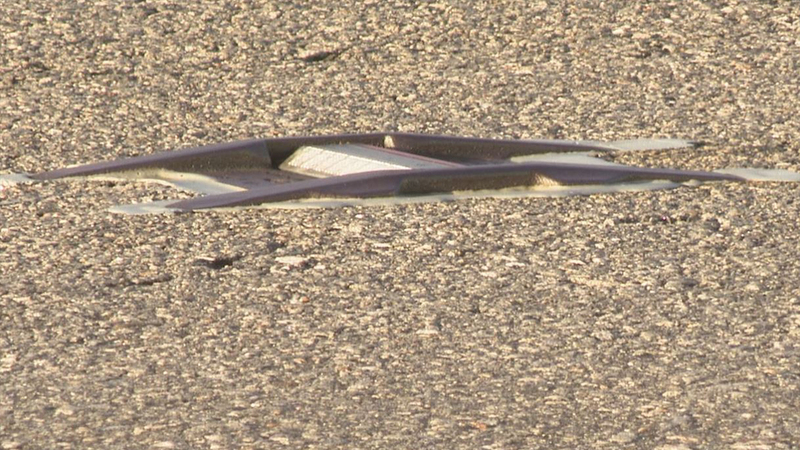 Henson said the reflector, or lane marker, flew up and went right into his windshield -- just inches from his face. "It would have (hit my face), if it hadn't hit the roof," Henson said. "(Within seconds) I couldn't really see because there was so much glass dust and stuff, but I could feel the breeze coming through the windshield." Henson said his daughter walked away with minor cuts and scrapes. He knows the situation could have been much, much worse. "It very well could've ended my life. I mean an inch lower and it would've gone through the windshield and into my face," Henson said. "I've been through some crazy things in my life, but I've never had that happen or anything like that." "This type of road hazard is a rare occurrence. Typically, snow plows push the loose markers to the side of the road when clearing snow and ice. NCDOT engineers will make a visual inspection of the area on Friday morning, and if needed, make immediate spot repairs. Transportation officials are currently preparing to award contract this spring to replace the markers and resurface the interstate from Mile Marker 55 to the McDowell County line."